Getec Industrial is a custom aluminum die casting products manufacturer that also offers precision metal stamping for aluminum services. Aluminum die casting and metal stamping are two very different processes with their own strengths and weaknesses. Aluminum stamping is a metalworking process in which thin metal sheets are bent and sheared into a desired shape by a hydraulic or mechanical press with punches and dies. One of the main benefits of metal stamping is that it is inexpensive when used to make relatively simple shapes. Aluminum stamping is best suited to projects requiring high-volume production of simple parts. One downside of the metal stamping process is that it leaves a high amount of scrap metal behind. The more complex the part, the more material goes to waste. The cost of that wasted material makes aluminum stamping less cost-effective when the desired part has many distinct features, narrowly spaced features, many bend stages, bend angles over 90 degrees, or side action features. Aluminum die casting allows for more cost-effective production of complex parts. Aluminum die casting services for extruded profiles involve pouring molten aluminum into a closed mold, then applying pressure to the aluminum as it cools to create the desired shape. Die casting is useful for parts with extremely complex features that require precise replication. A drawback with die casting is that it is aa more expensive method when used to make simple parts. , but because it uses materials more efficiently, It is a less expensive method than metal stamping for making complex parts because it uses materials in a more efficient manner. 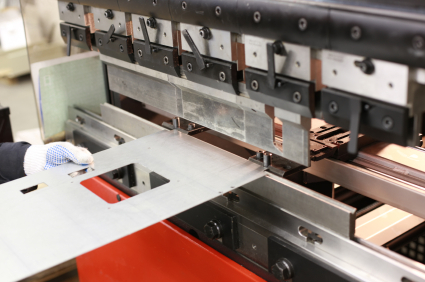 Both methods have their place in the custom aluminum extrusion manufacturing process. Are You Looking for a Thermal Management Solutions Company? Getec Industrial has over 30 years of experience as an extruded aluminum die casting manufacturer providing custom aluminum metal stamping services. If you need help on your next extruded aluminum heat sink manufacturing project, call us at 888-000-8499 or contact us online.